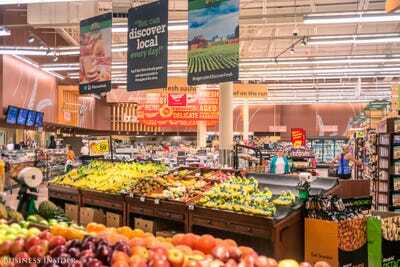 When it comes to grocery stores with cult followings, two legendary chains stand out: Kroger and Wegmans. 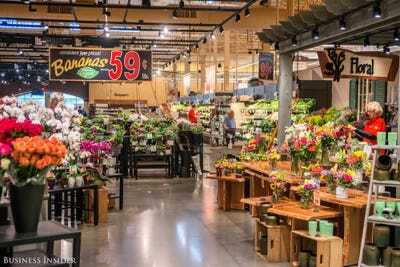 Kroger is famous for its low prices, while fans say that the Wegmans shopping experience is second to none. 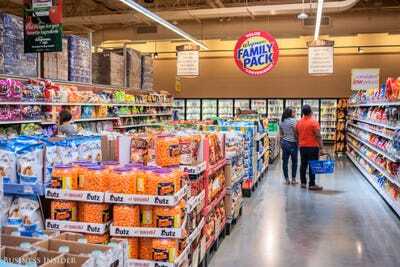 In an effort to determine which grocery brand reigns supreme, Business Insider decided to visit both chains and take stock of what each have to offer. Driving up to the Wegmans in Charlottesville, Virginia, it was immediately clear that this wouldn't be a normal shopping trip. 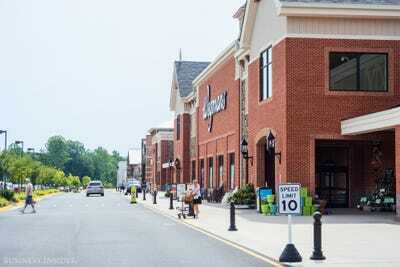 Wegmans is huge. Once we entered the store, however, we realised that it isn't just large -- it's a behemoth. 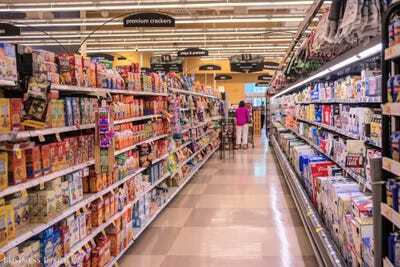 According to the company, locations stock up to 70,000 products. 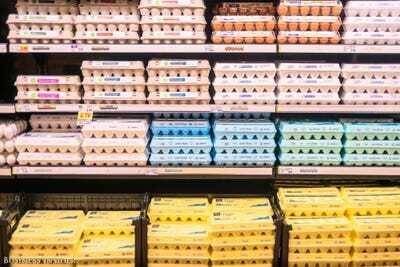 That's a ton, compared to the slightly more than 40,000 products that the average supermarket stocks, according to the Food Marketing Institute. 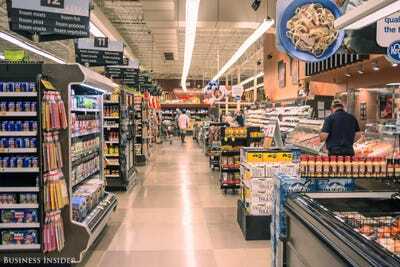 Awed by the grocery opulence, we wandered towards the prepared foods. 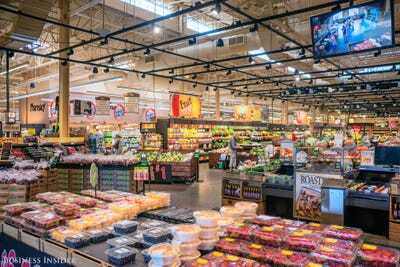 Wegmans fans praise the store's ready-to-eat section and, seeing the options from chicken wings to sushi, it's easy to understand why. 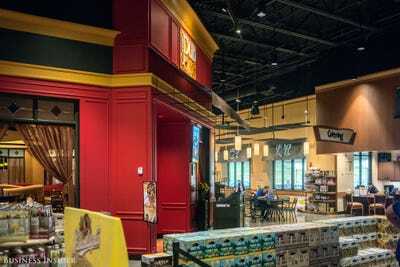 The store even has a 'pub,' complete with happy hour special, perfect for thirsty shoppers. Of course, the most important thing isn't the add-ons -- it's the groceries. 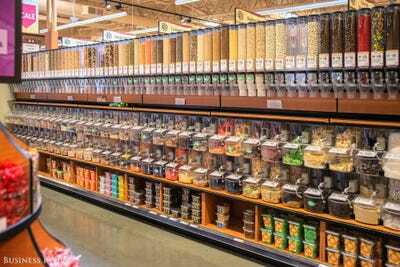 The store sells both Wegmans' brands -- which tend to be less expensive -- and pricier options. 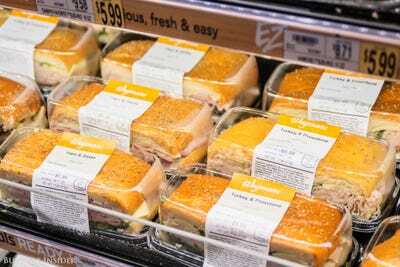 Family-sized packaging also helps cut down on costs. 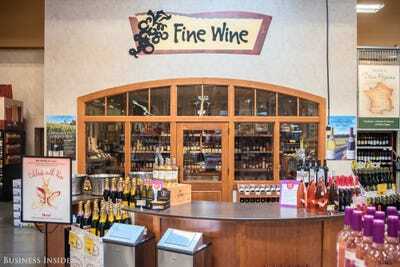 Wegmans has spacious aisles filled with everything from paper goods to champagne. 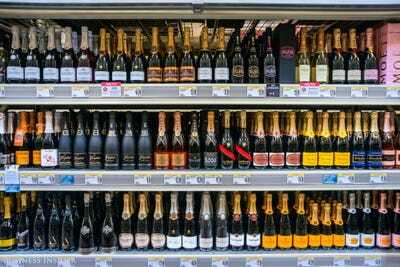 Speaking of champagne, the Charlottesville Wegmans also features a sprawling wine store, where you can buy everything from Veuve Clicquot for $42.99 to a selection of bottles for just $6. 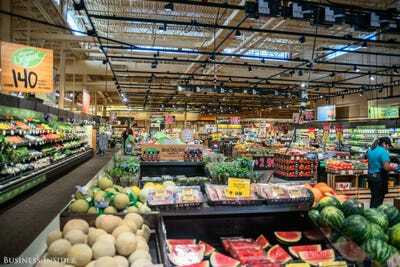 Leaving Wegmans felt like departing from a miniature self-contained village which could provide shoppers with everything they could ever want. 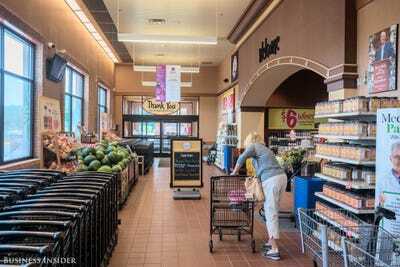 Arriving at a Kroger a few miles down the street felt like a return to reality. 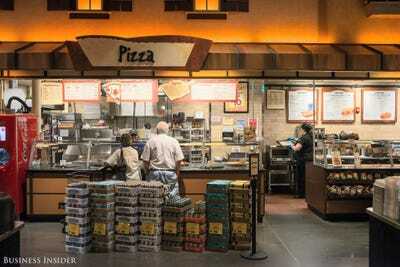 Gone were the soft lighting and wood-tones of Wegmans, replaced with classic supermarket florescent lights. 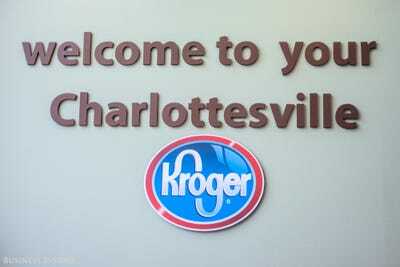 To be fair, Kroger isn't as focused on providing an upscale experience as it is on low prices. 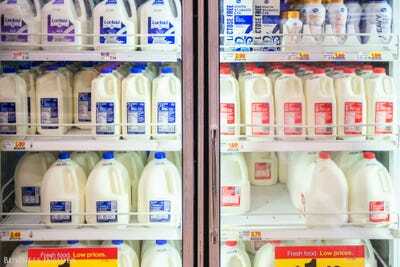 Items including apples and milk were slightly less expensive at Kroger. Further, sometimes finding a deal at Wegmans took a bit more hunting than at Kroger. While we originally believed the cheapest spaghetti at Wegmans to be a $1.49 box from the Italian Classics line -- significantly more expensive than the 88 cent spaghetti at Kroger -- a Wegmans spokesperson informed us that the basic Wegmans brand costs just 79 cents a box. The stores were more evenly matched on other items. Eggs were 99 cents and tomatoes were $1.99 at both chains. Bananas were actually cheaper at Wegmans, where they cost 49 cents a pound, compared to 59 cents at Kroger. While Kroger has been slashing prices, it is getting increasingly difficult for the store to beat out the competition when it comes to offering the lowest prices -- especially as European budget competitors like Lidl and Aldi expand in the US. 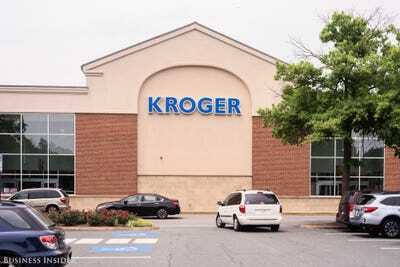 In March, Kroger's 13-year-streak of same-store sales growth came to an end. 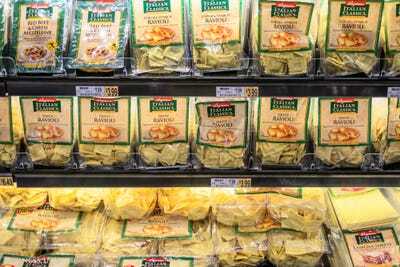 At Wegmans, prices aren't the only draw. Instead, it attracts loyal customers by providing a deluxe shopping experience and other perks like an expansive food court. 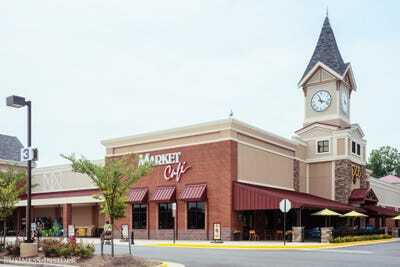 After visiting Wegmans, we understand what its cultish customers see in the brand. And, at the end of the day, we'd love to shop there again -- even if it means passing up on cheaper groceries at a chain like Kroger.